This Webinar is eligible for 1 PMI® PDU in the Leadership talent triangle category. If you are claiming this session, you must submit it to your MPUG Webinar History after it has been completed in its entirety. “Project managers” really are “people managers”. However, project managers too often forget the definition of “management”, which is “getting things done through others”. Project managers see their long list of tasks and tend to become very task-oriented. They become like goose farmers stuffing their geese with special foods to fatten their livers as quickly as possible which gives them “foie gras”. Project Managers stuff their team members with as many tasks as they can which gives them a project that finishes on time, they hope. They often lose their people-orientation in this race to the finish. The Critical Path in their schedule only tells them which tasks are driving their schedule and when, whereas the Resource-Critical Path in a project schedule shows WHO is driving the schedule and when. Come and see how you can become a people-manager! 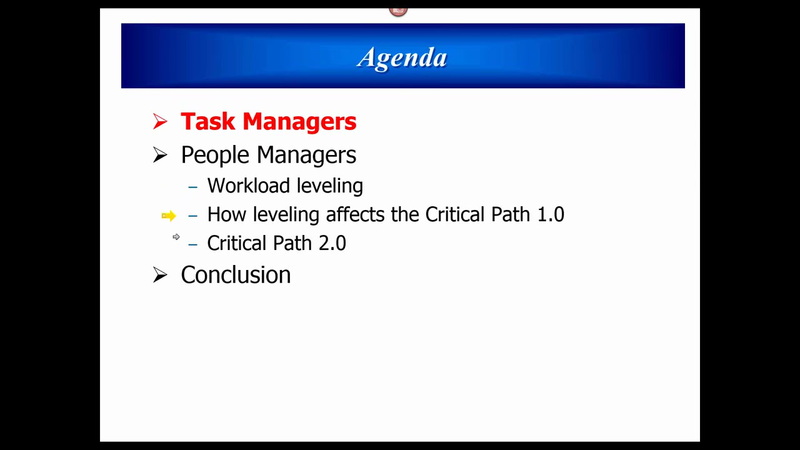 Eric: we do not “feed tasks to the teams”, rather the teams identify the tasks and feed them to the Scheduler. What am I missing here?